Hey, everyone, heads up to Adventures of Juan Or and Mommy to wish him a very Happy Birthday, please. 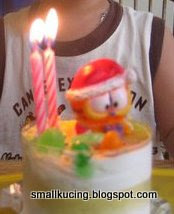 His mommy, Aunite Alice Phua, is one of the first blogger who followed this smallkucing ranting blog. Though we haven't meet Juan Or before. But from what Auntie Alice wrote(oh boy, she can really write), he has truly inherited his parents good genes. A fast learner. Have a wonderful day ahead to you! Aiyor...so small. Didn't buy big big cake for Juan? Not enough friend lah...like that! LOL!!! It is nice to know new friends. I will visit him and wish him Happy Birthday. Happy Birthday to Juan Or!!! Mamarazzi orang baik... Joshua also follow's Mummy's footsteps ok!! Happy Birthday to Juan OR. Woit, wanna eat your Assam Chai leh! LOL! i'm not a christian, but that paragraph from bible actually reads something meaningful..
Mamamrazzi, I am so touched that you not only couriered birthday present for Juan Or, but also invited your blog readers to visit JUan Or's blog to wish him happy birthday! (*tears in eyes*). Really appreciate your thoughtfulness! Btw, already visited their lovely blog and at the same time, dropped some wishes. Thanks for introducing another great blogger frend to us. I mean I didn't know you can buy the powder to make it. I always bought the can ones, once in the blue moon of my husband. I didnt know also until my SIL told me about it. As for the Can ones, i find it too sweet. Mamarazzi, pai-seh, pai-seh, although my written English is good, but my spoken English is actually very Manglish leh....hehehe!